This week, China’s People’s Liberation Army Navy (PLAN) celebrated its 60th anniversary. Delegations from 29 naval forces took part in the celebrations in Qingdao harbor which lies approximately 830 km south-east of Beijing. The theme of the four-day event was “Harmonious Ocean.” Chinese navy commander Admiral Wu Shengli expounded on the theme stating, “the ocean is the common home to navies of the world. It is the responsibility of every navy to protect maritime security while establishing a peaceful and harmonious maritime environment.” In the spirit of such naval harmony, a fleet review was held on Thursday of 21 ships from 14 foreign navies. The host country showed off 25 of its naval vessels and 31 aircraft. Possibly the biggest story of the military gala was the display of China’s Xia- and Han-class nuclear-powered submarines. Although many military experts were anticipating the unveiling of China’s most advanced nuclear-powered submarines, the Jin- and Shang-class subs, a glimpse of any Chinese submarine is rare. Chinese officials purportedly displayed the submarines to allay foreign countries’ concerns about the growth of China’s naval power and its lack of transparency. 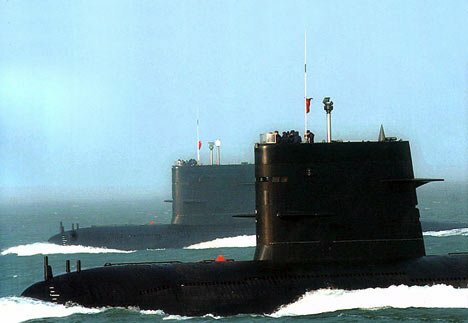 Submarines are a perfect metaphor for the secretive nature of China’s sustained arms buildup. But they also represent a material challenge to the U.S. Navy’s power in East and Southeast Asian. The stealth and destructive capabilities of submarines offer China an asymmetric advantage that could put the U.S. Navy’s dominant position in the region at risk. In October 2006, a Song-class diesel-powered Chinese submarine stalked the U.S. aircraft carrier U.S.S. Kitty Hawk in the Pacific Ocean. The submarine was only detected by U.S. naval forces after it surfaced within torpedo range of the carrier. It was a chilling revelation to the U.S. military. The incident showed that China could threaten its multi-billion dollar aircraft carriers with vessels that cost a fraction of the price. Curiosity surrounding Chinese submarines has mounted as the PLAN fleet has swelled and its activities have increased. According to information recently released by U.S. Navy intelligence, China now has more than 50 attack submarines and Chinese submarine patrols doubled in 2008. Concerns about China’s mysterious nuclear submarines might not have been erased by their presentation at the celebrations. At least, the public finally got to see stealthy Chinese naval vessels that have been the source of so much anxiety. If the unveiling of China’s submarines was the biggest story of the anniversary celebrations then the biggest story that wasn’t was China’s aircraft carrier. Military analysts and Chinese officials have long been talking about the possible construction of a Chinese aircraft carrier. Some experts even believe China might produce–or already be producing–multiple aircraft carriers the first of which could be commissioned by 2015. China’s intent to build a carrier is clear. In March, Chinese Defense Minister Liang Guanglie announced that China would not remain the sole world power without an aircraft carrier. However, no formal announcement regarding plans for an aircraft carrier was made during the anniversary celebrations. Chinese officials all the way up to President Hu Jintao, who is also chairman of China’s Central Military Commission, have tried their best to reassure the rest of the world about China’s good intentions. The “defensive nature” of China’s military was often mentioned during the four-day event. Concurrently, officials have asserted their country’s right to expand its military power and build aircraft carriers. Although some might see China’s message of peace and its pursuit of weaponry as contradictory, Chinese military officials see the two as mutually dependent. Zhang Xiaolin, a professor with the strategy and research office of the PLA Navy Command College asserted in an interview with Chinese state media, Xinhua, that, “The PLA Navy will not alter its nature of peace, even if it has aircraft carriers.” Zhang added, “China has chosen to rise peacefully. Only a mighty military power can guarantee such a peaceful rise and contribute more to the maintenance of the world peace.” However, there is more to China’s arms build up than peace and security. Prestige is another driving force for the country that some experts have described as “insecure.” Chinese Admiral Hu Yanlin was quoted in China Daily as saying, “building aircraft carriers is a symbol of an important nation. It is very necessary.” Admiral Hu is not alone in his opinion, many government officials have made similar comments on the matter. Aircraft carriers are meant to project a country’s power well beyond its borders. Being that China hasn’t had a serious military conflict in over three decades; and, historically, most of its military conflicts have been land wars with its neighbors, it is hard to see why China feels the need for aircraft carriers. China’s perplexing pursuit of aircraft carriers aside, the U.S. Navy and other foreign navies are stepping up their cooperation with the PLAN in order to strengthen ties and head off potential problems with the rising power. The thinking behind such cooperation might reflect the old adage: keep your friends close and your enemies even closer.